The Diet to Go meal delivery service offers 3 complete meal plans and boasts the best tasting diet delivery food among GlycemicEdge users. 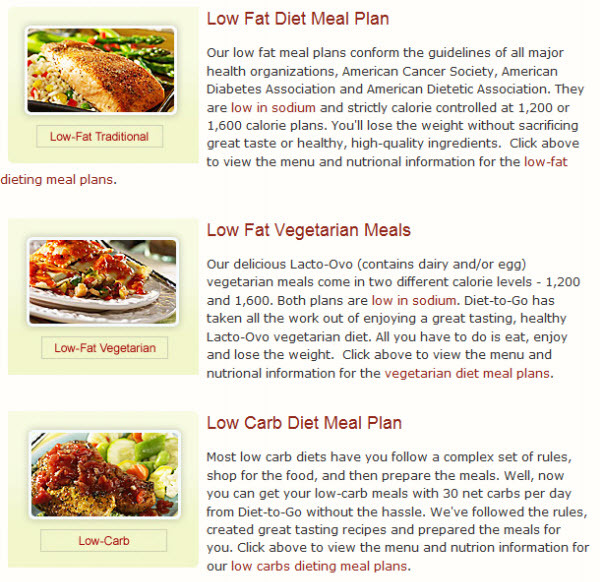 Great tasting food and a variety of menu choices make Diet to Go a nice alternative vs. those like Nutrisystem. We really like the flavor and breadth of choices available, and their menu choices offered huge variety and allowed us to easily pick good carb (log Glycemic) foods, whether following a Glycemic, Zone, or South Beach diet meal selection plan. It's really nice to have an option that's not just reconstituted frozen fare like you get from Nutrisystem — view our comparison grid of meal delivery companies for more information.